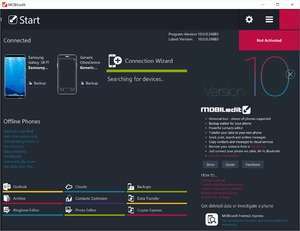 MOBILedit is the Ultimate PC Suite for All Phones. MOBILedit! provides you the ability to control your phone from a PC. After downloading MOBILedit to any PC, you can connect your phone via cable, Bluetooth, wifi or using mobile app. For security reasons, you should also check out the MOBILedit! download at LO4D.com which includes virus and malware tests. Additional screenshots of this application download may be available, too. 4.5 out of 5 based on 32 ratings. MOBILedit has a presence on social networks. MOBILedit download been highly rated by our users.